Yes, I did!! 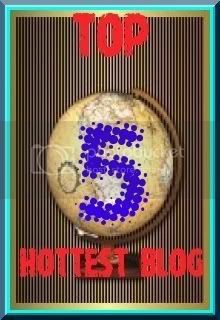 This blog is included as one of the top 5 hottest blog. My blog is #7 which meant it's tied with another blog...I think. Gagay was the one that actually told me about it a long time ago. I did my part and nominated some blogs but I didn't expect this blog to be included in the list of the 'final' winners. Woo Hooo!!! I am coolingstar9, very happy to know that you have received Top 5 award, keep it up, I wish you successful in year2008. Congrats po!! You really deserve it!